It’s been a week since the government repealed the Interstate Highway Neutrality Act (1912) on April 1st, 2020. Since then the new speed limit laws have created huge traffic tie-ups, average people taking ages to get to their destinations, and trucker road-rage is at an all-time high. So what does this repeal mean? Prior to April 1st, 2020 everyone had to obey the speed limit. If it was 70 in your area, then private cars, trucks, buses, everyone had to stick to that. But with the repeal that has all changed. Trucking companies, and well-heeled BMW owners, can pay the government to allow them to legally drive above the posted limit. But if you don’t pay then the limit’s the limit for you. But it didn’t have to be that way. The government told everyone they planned to repeal and requested public comment, but no-one bothered to voice their opposition, so now it’s the law, for better or worse. Well actually the above is just speculation to make a point. The Federal Communications Commission (FCC) has announced a plan to do away with neutral traffic speeds on the Internet. If this happens, big companies will be able to pay to have their data travel faster than yours. And the increased use of the “pipe” will mean that yours may go even slower when a lot of paying companies are hogging the bandwidth at higher rates. To read the FCC press release click here. The BBC also has an informative article here. Of course it should come as no surprise that this is Trump’s doing, and the BBC wrote about that here. There is a very effective page here that visually displays the issue. 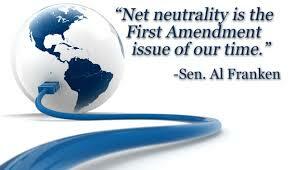 Why Is Internet Neutrality Important? A free and open internet stimulates ISP competition. A free and open internet helps prevent unfair pricing practices. A free and open internet promotes innovation. A free and open internet promotes the spread of ideas. A free and open internet drives entrepreneurship. A free and open internet protects freedom of speech. They go on to say “Without an open internet, big corporations would have tight control over how we access websites and services.”. Search Google for Why Is Internet Neutrality Important to find out what others think. Make a fuss and make sure our government knows we don’t want the changes to happen. This BBC article says that you have until mid-august to tell the FCC what you think of this terrible idea. But don’t delay, react today. Leave a voice message for Mozilla, which will collect them all together as an audio file and send them to the FCC. Make Your Opinion Know Here. So don’t delay, do it NOW!